LyricsSpeaker is not the only browser add-on that can search for songs’ lyrics. A2ZLyrics, ElectroLyrics, and LyricsBuddy, are identical programs, all of which are also categorized as adware because of their capability to display different advertisements. 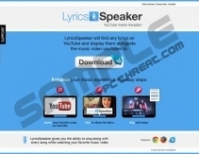 LyricsSpeaker is sponsored by different advertisers, all of which seek to acquire as many click as possible. The advertisements are sent from various advertising domains, some of which are given in the advertisements. Note that LyricSpeaker only displays ads but does not carry responsibility for your interaction with the third-party websites and the consequences that follow. You may be provided with adverts that take you to unknown websites that have poor ratings, and if you do not want to risk your privacy and the performance of the PC, which may change if the machine gets infected, be careful when interacting with LyricsSpeaker ads. 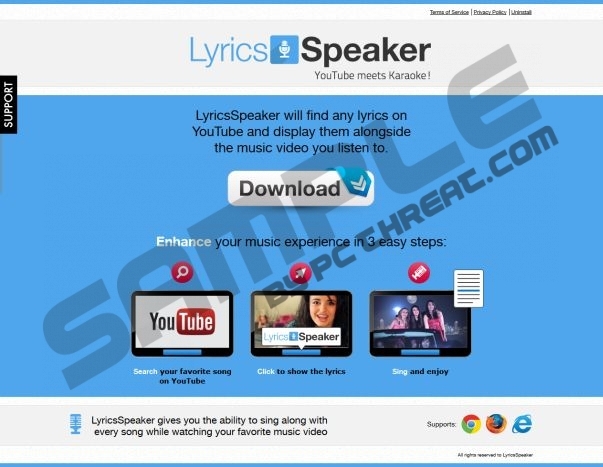 Remove LyricsSpeaker from the PC if you do not want to find flashing advertisements, randomly hyperlinked works and various pop-ups or pop-unders. The sooner you remove the adware program, the sooner you eliminate cookies and other tracking devices that are used by LyricsSpeaker and the third-party websites. The application collects non-personally identifiable information about you in order to find out your preferences and use the collected details for advertising purposes. It does not seek to reveal your identity, but it does not mean that it the information collected cannot help the creators to find out who you are. We recommend that you remove LyricsSpeaker from the computer using a spyware removal tool. Use SpyHunter because it can eliminate the adware program, cookies, and other undesirable computer applications or files. Moreover, the recommended program can protect the system from dangerous threats, so if you do care about your privacy, take action right now. Press Win+R and type in control panel and click OK. Select Uninstall a program and remove the unwanted adware program. Scan the computer once you finish the removal so that you find out whether some extra measures are necessary. Quick & tested solution for LyricsSpeaker removal.